We love to share our expertise as instructional designers and content developers, and we do so through a combination of online workshops and live classroom events. Our skilled instructors will share their practical experience with you and give guidance as you practice and apply your new knowledge right away. We teach classes on common authoring tools like Lectora, Articulate Storyline, Captivate, and Easygenerator, and conduct custom workshops on rapid design and development techniques.We are known throughout the industry as an expert that will educate your employees in the most engaging, expedient, and cost-efficient manner. "Dan explained this in a way that made me fully grasp how to make Articulate work the way I want it to work." Our instructors have a consistent rating of 4.9 out of 5 - and we have the clients and testimonials to prove it. Our goal is to provide you with a practical, hands-on learning environment to foster the skills needed for real projects. The benefits of our instructional approach extend beyond the classroom. Your instructor will provide practical reference materials and ongoing help after you finish your training. Your success is our mission. We make house calls! Contact us to meet with an instructor and discuss how classes can be tailored to meet your needs and delivered at your location. Need to get out of the office? 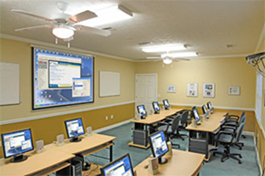 We also offer classes at the IAC Training Center in Atlanta. Our classroom can accommodate up to 12 attendees in a comfortable setting. Is travel not an option? Don't worry! We offer classes via GoToMeeting. The collaborative features of GoToMeeting create a high level of engagement and topic personalization wherever you are located. View our current training schedule here. Visit our Store for training packages or Contact Us for more information. Request information and class details.